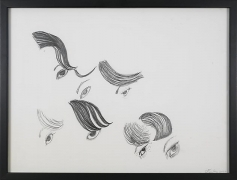 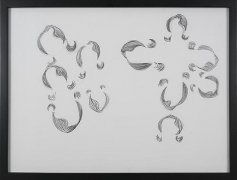 The exhibition included two bodies of drawings, in Finley’s signature pen-and-ink style. 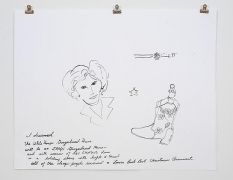 In the first group, The Dreams of Laura Bush, Finley channels the First Lady’s unconscious through illustrations and text that imagines inner psychological conflicts, incorporating sexual fantasy, popular culture, and current political events. 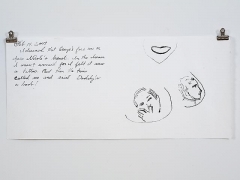 Imagining the personal lives of the White House and their Freudian impact on global politics, Finley satirically morphs the personal and the political. 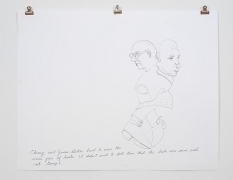 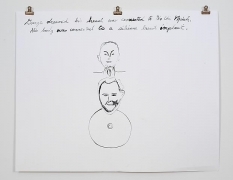 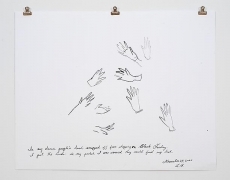 In one journal entry, Laura Bush writes to her husband, begging him to go to therapy for help with his depression, “You have destroyed the trust of the nation, but do you have to destroy us, too?” A second suite of drawings considers another powerful female political figure its subject. 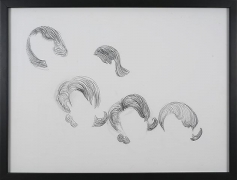 Media images of Secretary of State Condoleeza Rice are extracted and analyzed, isolating wisps of hair, eyes, hands and shoes, transforming familiar gestures into small figure studies reminiscent of post-Impressionist sketchbooks. 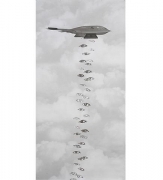 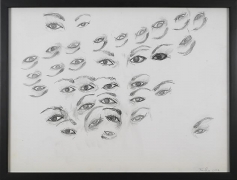 In a large-scale graphic work, Rice’s eyes are dropped as bombs from a military plane, transforming Iraq war imagery into a Surrealist landscape. 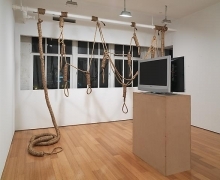 An installation made of rope occupied the gallery’s main wall, consisting of nooses based on Sadaam Hussein’s execution. 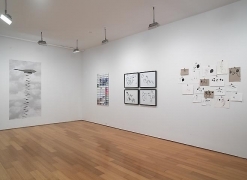 At first glance, this dense arrangement of ropes reads as a single textile work, evoking Eva Hesse’s sculptural work and 1970s craft-oriented Feminist work. 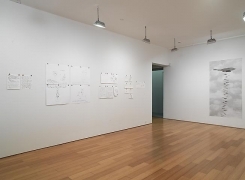 In this installation, Finley questions the cancerous way that violence breeds more violence. 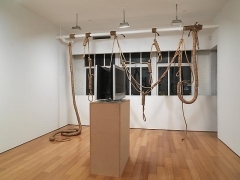 While specifically rooted in the former Iraqi dictator’s death, Finley is also interested in what was familiar about the image of Hussein being noose-hung—images of the Salem Witch trials and KKK lynchings, for example—placing global capital punishment further into an United States context. 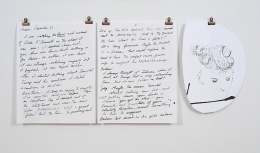 In the same space, a media-based installation continuously polls the deaths in Iraq; one station showing the names of U.S. soldiers who have died; the second, a list of Iraqi citizens whose death count has gone largely unnoticed by the U.S. public.